Description: NS 9589 stopped right under the coaling tower making for a nice shot. Description: Train 139 is has just met I12 and is easing up to the signal at the end of the double track at Lyman 1/2 mile away. The 2nd unit is a toaster, but I cannot make out the number. 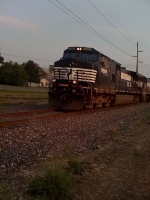 Title: NS 9589 backing into the yard. Description: NS 9589 backing into the yard. 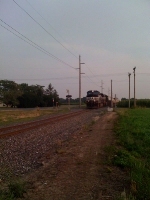 Title: WB NS 9589 at Albion, Il.. Description: An NS lead freight passes a UP mix that waits patiently for clearance - having just passed under Elysian Fileds. Description: Yeah, my friend was using iPhone and taken shot em.. Description: This view, taken from through the door window of the last car of train 93(14) has this southbound NS train pictured at MP 83 (center left), PW line. 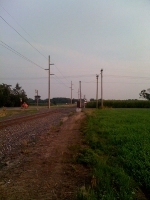 Train was standing at the time and a NS crewman is visible on the gangway. This picture rejected by railpictures.net for horizon unlevel. Tells me the screener never rode on the rear platform of a amfleet car at 125 MPH coming off an engineered curve. Horizon unlevel...geez. Description: After waiting almost 2 hours to move half a mile, NS W8Q finally rolls into the yard for a crew change.